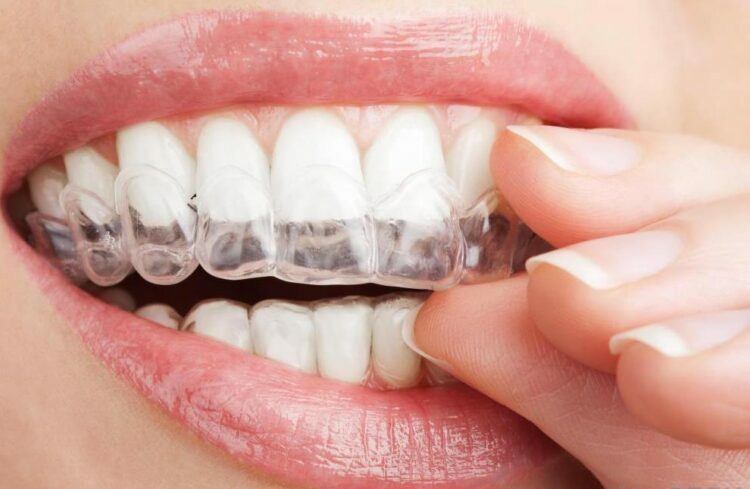 The dentist will instruct you to place a small amount of the bleaching gel into the trays and wear the trays for up to an hour a day for one to two weeks. Great results are achieved in 10 to 14 days. 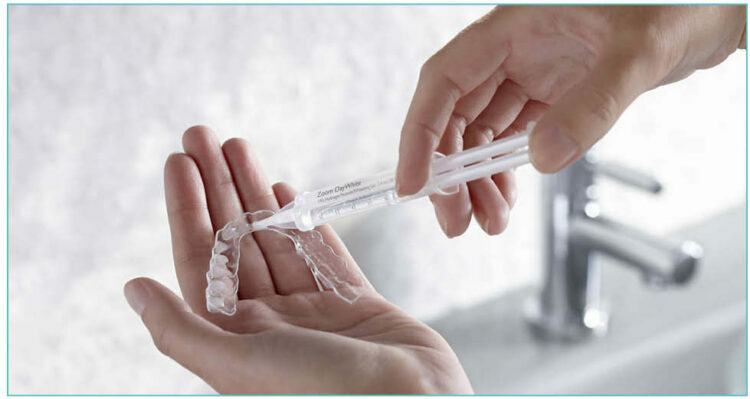 The Home Teeth Whitening Kit starts at AED 2,100. 1- You get faster results. That’s because your technician can use a higher concentration of bleach solution. 2- The second benefit is that, in an office, dental technicians protect your gums with a resin barrier, then apply a hydrogen peroxide solution to your teeth. This solution seeps down past the enamel and into the dentin, which is where the stains like to settle in. Hydrogen peroxide breaks down the chemical bonds inside the discolored dentin to make your whites pearly again. Shining an LED light on your teeth activates the solution and speeds up the process. You’ll have to sit through 3 x 15-minute sessions, with little breaks in. 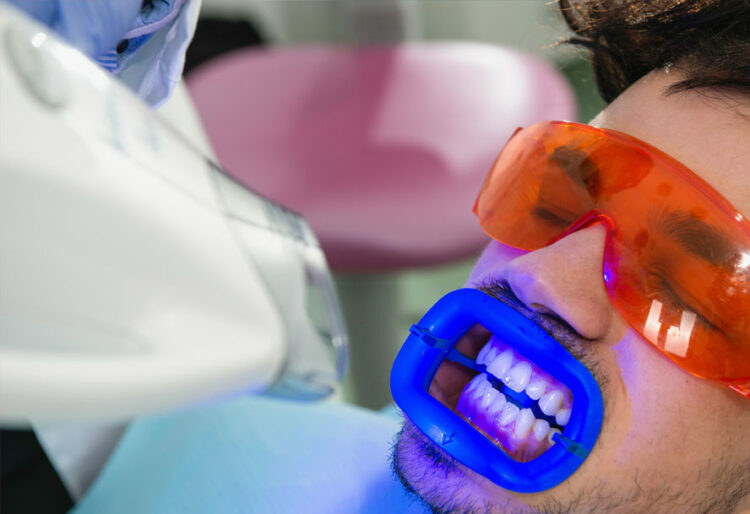 Before going in for a Zoom treatment, you should get your teeth cleaned because If you’ve got tartar on your teeth, you could get blotchy results. After ZOOM you need to be careful for 48hours. Don’t smoke, or consume dark foods and liquids like red wine. Dr. Michael Formenuis a very passionate dentist, started Dr. Michael’s dental clinical in Sweden in 1982. His clinics were in five locations and he also had a laboratory across Stockholm. With a vision focused on the provision of great dentistry services, he opened other clinics in the UAE. He currently operates five state-of-the-art dental clinics that offer more than one specialty service. Three clinics are located on Al Wasl Road (Umm Suqeim). The other two dental clinics are in Jumeirah and Dubai Healthcare City. These clinics have the finest team of experts in dentistry, dental hygiene, specialized treatment and support staff. The fact that they use Wand, a painless anesthesia, makes Dr. Joy special. It has brought relief to the many people who fear needles and the associated pain. Wand is the most recent anesthetic administration using computerized control and is used in dentistry. 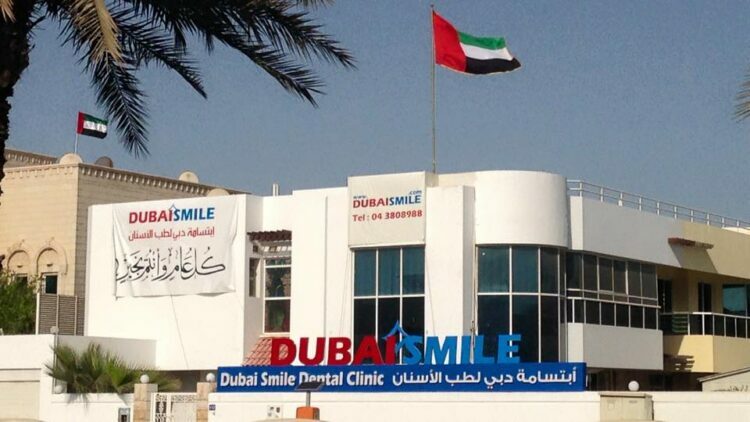 Their Jumeirah clinic in Dubai is open during all hours of the day to help you in case you have a dental emergency. You don’t need to have booked a prior appointment. There is also valet parking available at the clinic in JRB. The aesthetic surgeons and the implantologists all attended the American Academy of Cosmetic Dentistry also known as AACD. Dr. Mahmoud, Dr. Saed and Dr. Bana have many accomplishments. 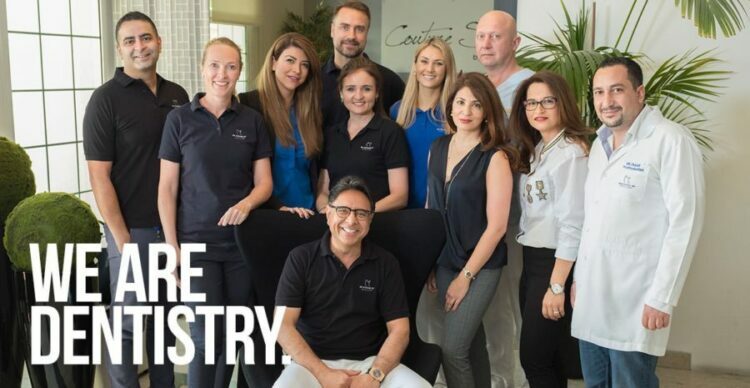 They have published many journals, lectured in many cosmetic conferences and meetings, are the most known cosmetic dentists in the regions and to top it all off; they are the designers of the smile that many celebs in the UAE and GCC countries wear. Jumeirah Beach Road. Jumeirah 3. Villa 512. It is located in Burjuman Business Tower on the 21st floor. The Dubai Sky Clinic has designed its treatment rooms to match your lifestyle with high-quality dental care. When seated in any dental chair, you have access to a TV as a form of distraction during your treatment. There are six dental residents from Germany, USA, Lebanon, and France who you can be confident, offer the most current treatments excellently. It is open for twelve hours each day of the week starting from 9 am. Open from 9 am to 9 pm, 7 days a week. It is at the heart of Dubai Health Care City and is an expansion of a business model that has had years of success in Germany. They value the promotion of a calm environment much like it is on an oasis. They offer services in Arabic, English, Spanish, German and Russian and they serve much of Dubai’s population with an effort to make you feel at home. German Dental Oasis has partnered with 15 insurance companies to cater for those who have dental care as part of their benefits as employees. In the event that you are not covered, you can receive the expensive treatment plan with a payment plan.